(Newser) – Father knows best? President Trump rejected the advice of aides and personally dictated a statement for Donald Trump Jr. when news of the younger Trump's meeting with a Russian lawyer during the 2016 campaign first surfaced, sources say. 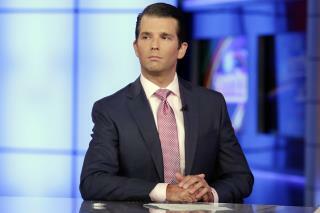 According to the Washington Post's sources, advisers with Trump at the G20 summit told him the best strategy would be for Trump Jr. to try to defuse the situation by quickly issuing a truthful statement about the meeting with Natalia Veselnitskaya. But Trump decided on a different approach while taking Air Force One home, the sources say, and came up with what turned out to be a misleading statement claiming that the June 2016 meeting had been about adoption. Steve Colbert says that makes him a dictator. So, "misleading" is a synonym for "accurate"? Who knew?